The office building at 210 Allegheny Ave. in Towson, following $1 million in upgrades, reached 62 percent occupancy after ownership inked a pair of new leases. Owners Chesapeake Real Estate Group LLC and Cicero Capital Partners LLC signed law firms Forster & LeCompte LLC and Chason, Rosner, Leary & Marshall to deals totaling 5,374 square feet of space. Tool maker Black & Decker signed leases for 13,200 square feet of space at the 30,000-square-foot building earlier this year. “Both firms cited the recent exterior and interior upgrades completed, that positions the building as best-in-class in this submarket, as important factors in their respective real estate decisions. Activity remains strong in the Towson area and we are negotiating with additional users,” Christopher Murray, vice president at Chesapeake Real Estate Group, said in a statement announcing the deals. Cicero Capital Partners and Chesapeake Real Estate Group purchased the building in the fall of 2016 for roughly $1.07 million, according to state tax records. The companies invested in improvements to the property, completed in 1978, including exterior signage, coating to provide a modern appearance, and overhauling common areas and the lobby. The deals, revealed on Tuesday, include 1,600 square feet for criminal defense firm Forster & LeCompte, which is relocating from Baltimore. 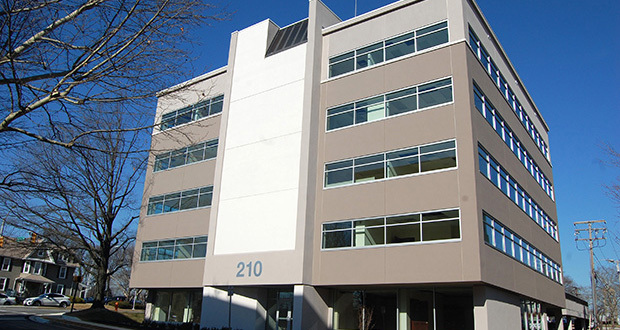 Full-service law firm Chason, Rosner, Leary & Marshall signed for 3,774 square feet of space. Brendan Lough and John Fulco, of JLL, represented the latter in that deal. Murray represented the landlord in both transactions. The direct vacancy rate in the Towson office market reached 11.5 percent in the third quarter of 2018, according to a report from MacKenzie Commercial Real Estate Services. That figure fell from 12 percent at the same time last year, and 12.1 percent in the second quarter. 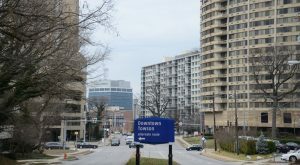 Asking rents for office space in Towson, according to the same report, were recorded at $20.77 per square foot in the third quarter. That was an increase from $20.45 at the same time in 2017, but down from $21.01 in the previous quarter. The property at 210 Allegheny Ave. is in downtown Towson. Baltimore County, during the administration of the late County Executive Kevin Kamenetz, sought to spur a live, work, and play development pattern in the suburban county seat. Towson has drawn more than $1 billion in real estate development in recent years, including Retail Properties of America’s $125 million Circle East project and Greenberg Gibbons, in a joint venture with Caves Valley Partners, $350 million Towson Row development. 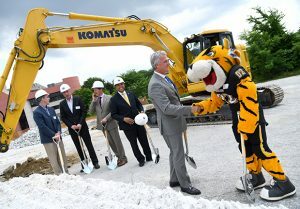 Towson University, which estimates its annual economic impact to the area at $1.8 billion, has also boosted development interest. The school is seeking designation as a Regional Institution Strategic Enterprise (RISE) Zone. If the state grants the university’s request for designation, businesses locating to the area and which invest a minimum of $5 million and create at least 50 jobs could be eligible for tax credits. The Maryland Department of Commerce is expected to decide on the RISE zone designation early next year.